Albrecht Dürer (1471–1528) is a famous Renaissance artist. Mathematicians probably know him best for his work Melencolia I which contains a magic square, a mysterious polyhedron, a compass, etc. Dürer wrote this book as a technical manual for artists, craftsmen, etc. For example, it gave elementary instructions for how to draw regular polygons with a ruler and compass. In Dürer’s time the old works of the Greeks were just becoming available again. Dürer apparently had access to them. In fact, the book begins, “The most sagacious of men, Euclid, has assembled the foundation of geometry. Those who understand him well can dispense with what follows here.” This is an odd beginning because, although he gives some Euclidean constructions, many are new; moreover, he must have known that the vast majority of the readers knew no Euclid. Because this is a technical manual, Dürer’s emphasis is on easy-to-draw constructions that look good—in particular, some are just good looking approximations. Many of them were known to craftsmen of the day (techniques passed down through the generations) or appeared in print earlier, but some may have been discovered by Dürer. I was led to the book because I wanted to see his construction of the regular pentagon. He gives two constructions. One is a classical Greek construction, but it is the second that I wanted to see. This construction has two notable features. One is that it is drawn using a rusty compass—that is, the compass is set to one opening for the entire construction. This was probably a great bonus to the artisan; I imagine that not having to continually adjust the compass made the construction fast and accurate. The second interesting fact is that it is only approximately a regular pentagon—but it is a very good approximation. By my calculations, the error in the height of the pentagon is less than 1%. The construction is shown below. You begin with the line segment labeled and you set the compass to this radius. I’ll leave it as an exercise to the reader to reverse engineer the construction. Dürer never says that this is an approximation. I found what I was looking for. But then I found more. 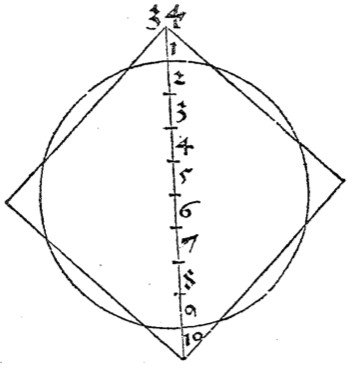 Dürer goes on to give ruler and compass constructions of regular polygons with sides numbering 3, 4, 5, 6, 7, 8, 9, 11, and 13. As you may know, some of these are impossible constructions (7, 9, 11, and 13). 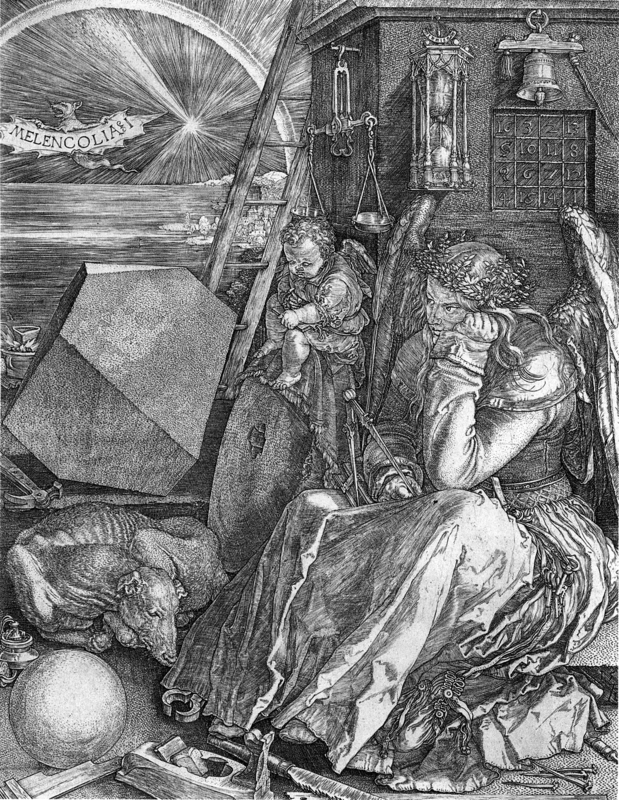 Hence Dürer’s constructions must be approximations. The heptagon (7-gon) and the nonagon (9-gon) are excellent approximations. So I though I’d share them with you. 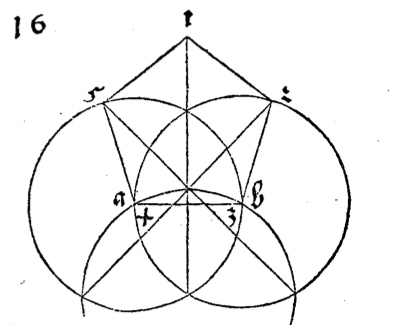 Durer’s heptagon is remarkably easy to construct. Begin with an equilateral triangle inscribed in a circle. Then half of the side of the triangle is nearly the same length as the side of the inscribed heptagon. So all we must do is bisect one side, and sweep an arc to obtain the first side of the heptagon. Then use this side to draw the rest. The construction of the nonagon is a little more involved. Draw a circle. Then with the same opening of the compass draw three “fish-bladders” (as he calls them)—to do this you need the centers on the vertices of an inscribed equilateral triangle. Draw a radial segment inside one fish-bladder and divide it into thirds. Draw a perpendicular line at the 1/3 mark. 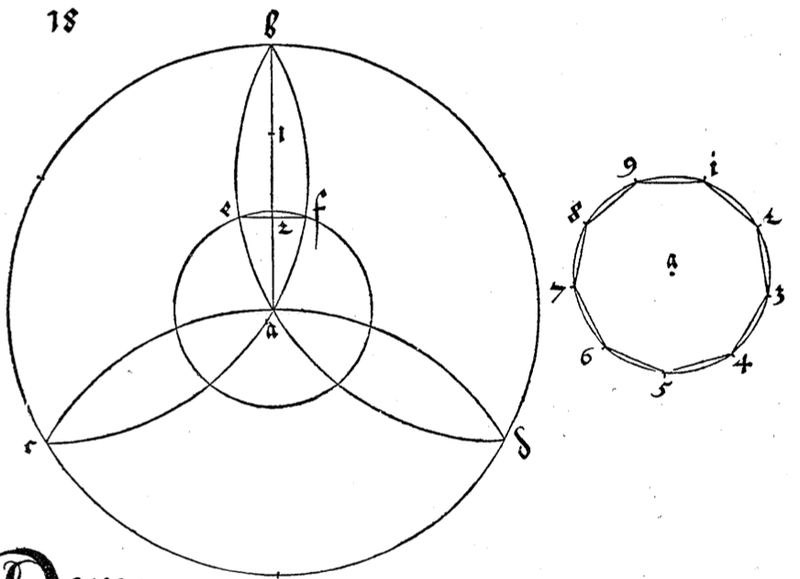 It intersects the bladder in two points ( and in Dürer’s diagram). Draw a circle with the same center as the large circle, passing through and . Then is one side of an (approximate) nonagon inscribed in the smaller circle. 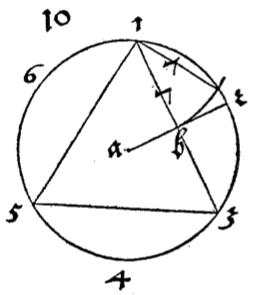 As if that is not cool enough, Dürer tackles the famously impossible angle trisection and circle squaring problems. To see his (approximate) angle trisection solution we begin with an arc of a circle and the corresponding chord. (He actually trisects the arc, but that is equivalent to trisecting the central angle.) He begins by trisecting the chord. The points in his diagram are, in order left-to-right, , , , and . Draw perpendicular lines from and to the arc, then swing arcs from these points (with centers and ) down to the chord. These new points are and . Trisect the segments and . Using the points closest to and , sweep arcs back up to the original arc of the circle to obtain and . Then arcs , , and are approximately equal (he does not admit to this being an approximation). What a great find and an enjoyable read! By the way, I encourage you to try performing these constructions. I did so using Geogebra and was amazed by the resulting figures.